Definition at line 32 of file router_flexml.hpp. Definition at line 434 of file router_flexml.cpp. Definition at line 427 of file router_flexml.cpp. Definition at line 449 of file router_flexml.cpp. Definition at line 472 of file router_flexml.cpp. Definition at line 501 of file router_flexml.cpp. Definition at line 518 of file router_flexml.cpp. Definition at line 49 of file router_flexml.hpp. 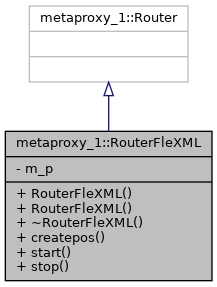 Referenced by metaproxy_1::RouterFleXML::Pos::clone(), createpos(), metaproxy_1::RouterFleXML::Pos::move(), RouterFleXML(), start(), and stop().